[Nov, 2014 Update: The method below does not seem to work anymore, but a 64-bit ARM emulator “emulator64-arm64” has now landed in AOSP, and updated instructions are available here]. Most people can’t afford Juno Cortex A57/A53 development board, and mobile processors based on the latest 64-bit ARM cores are only expected by early 2015. 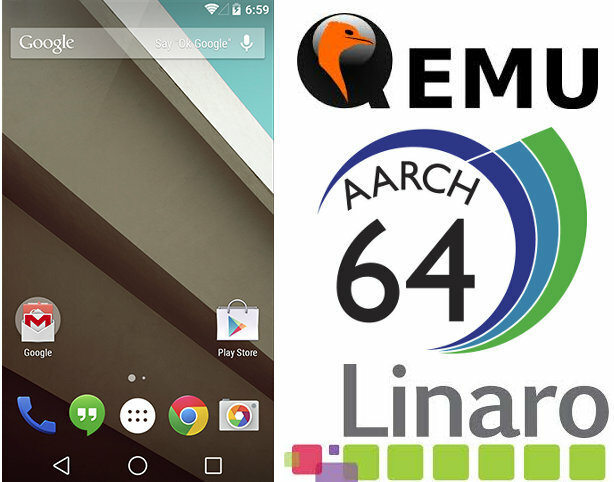 But thanks to a small team at Linaro, you can now build and run Android L 64-bit ARM in the latest version of QEMU that supports Aarch64. Alex Bennée, an engineer working for Linaro, wrote a blog post in Linaro’s Core Dump blog explaining the Android emulator is actually based on QEMU, the differences compared to mainline QEMU, the work they’ve done on Android L at Linaro, and most importantly, provided the basic steps showing how to build and try Android L 64-bit ARM (ARMv8) in QEMU. I’ve just done that, but unfortunately, albeit the builds complete, I could not manage to start Android L in QEMU yet. [Update: working now]. If you want to give it a try, you’ll need a Linux PC, and patience, as it may take about one day to retrieve the source code, and build everything from source. I’ve done all this in a computer running Ubuntu 14.04 with an AMD FX8350 processor and 16 GB RAM. The last step can take a few hours depending on your internet connection to Google servers. git config --global user.email "name@email.com" git config --global user.name "Your Name"
The last step will again take a while. It took my machine 2 or 3 hours, and the total time was actually a bit more than than as my PC suffered two thermal shutdowns during the build, and I had to restart the build twice. The last time, I decided to underclock my CPU to 3.4 GHz, and the build went through. So it’s quite possible there’s a problem with adb, but Google did not help, and I failed to go further. More detailed instructions will soon be posted in Linaro Wiki, so I may be able to find out where I made a mistake once it’s posted. 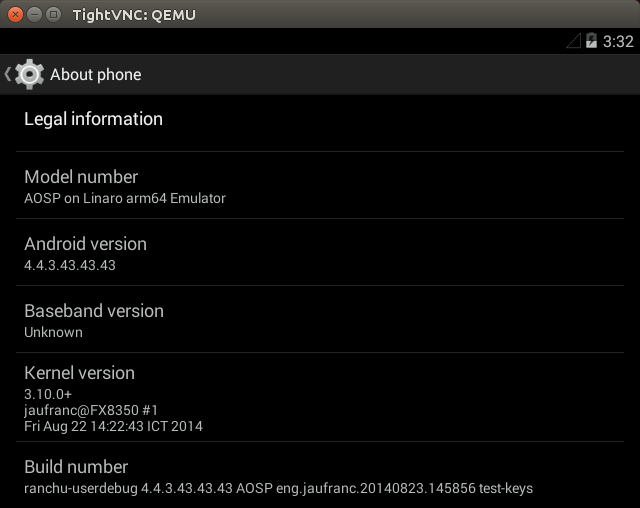 Here’s a screenshot of the “About Device” menu in Android L 64-bit ARM running in QEMU. Let me know if you manage to start Android L.
I think your also missing the patch that links /dev/qemu_pipe to /dev/android_pipe in the Android build which is why adb isn’t starting. Thanks I’ve applied the patch in system/core, and build android again. But no luck, still the same error. I’ve updated the post in case somebody manages to get it working. I think I’ll just wait for the Wiki entry in Linaro. Hi, is there a version of this for 32 bit ARMv7 SBCs running Linux like my Jetson TK1 with Tegra K1? I encountered the same error, i.e “adb_server_notify: Failed to establish connection to ADB server”. And my solution is to lunch an ADB server at localhost. It’s quiet simple, just type adb start-server” in the console, and it will lunch an ADB server at localhost. Once QEMU conntects to ADB server, it will boot the Android64 after few minutes. I successfully booted it and the model number showed “AOSP on Linaro arm64 Emulator”. Though the browser failed to lunch for unknown reasons. Thanks it works now! I also had to install and run vncviewer. I’ve updated the instructions. I have done all like you,but system will stay in “ANDROID” and have log ” No [stack] line found in /proc/self/maps!” when logcat in adb shell.My AOSP is downloaded at 19th August.Is it some error in AOSP? 3. After started the VNCviewer, it is not booting only the ANDROID display is continuing. Could you help me resolving this ? Thanks for correcting the omissions in my post, I’ve updated it. Depending on your machine, it may take a while to boot into Android, so maybe you have to be patient. Otherwise, you may need to check for any errors in adb. But the vncviewer is still showing the android display only. Could you give suggestions if anything that I can try to resolve it? Maybe try to use dmesg or logcat in the shell. It’s also possible the code has changed since, and it does not work. I’m not entirely sure, because I’m not the one who did this, I just tried the instructions provided by Linaro. If you can’t find a reason, you could also contact linaro on IRC. Alex Bennee should know much better than me. I took the logcat and getting the following crashes. What would be the reason for this crash ? It would be helpful if you can give some more inputs. Same error as @davy . Maybe you’ve hit a bug. Try to contact the Linaro guys to see what’s going on. After this the make -j8 was successful. Is there any issues that can be related to this. I am very new to android. I am seeing the same crash. Do you have a fix for this crash? don’t look at tskill, that’s just a consequence and the place where the code finally crash; the problem is in libart, the runtime.create, something wrong passed by patchoat! Great! I’ve linked to your updated instructions in an update at the top of my post. Great! Thanks. It works for me. I meant to say there were no home directory (/home) or /sdcard found in the filesystem of the emulator. It was a typo above. Hey, seems I met the same problem with you. I am using Lollipop AOSP。adb is OK and I can see the “ANDROID” endlessly flashing. The logcat shows that after art called dex2oat, the booting crashed with no [stack] line found. Have you ever got any solution or workaround? android-init-tweaks.diff is missing in the link below. The file seems to be gone. I tried to manually patch it and here’s the resultant diff. Going to try to build it now. Please read the first two lines of the post. I read it! and i run android 5.0.0_r7 arm64 on qemu，but i try to compiling android kernel 3.10 the kernel Image can not booting android 5.0.0_r7 arm64 on qemu ，but kernel-qemu in AOSP can! can you tell me how to compiling the android kernel 3.10 ,i read and i want to try! Sorry, I’m not sure how to do that. I can see the other link they don’t seem to use android-init-tweaks.diff patch. OK,thank you all the same! LXC et Android 5 ARM64 use qemu so i try this link! I am facing “binder: 739:739 transaction failed 29189, size 0-0” issue.. i dont know how to fix..
Can any one please help me how to fix this?